(CNN) -- Oliver Yeh is the kind of guy who cooks up ideas so kooky, so out-of-this-world, that even his fellow MIT students tend to roll their eyes when they hear them. 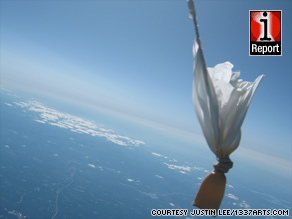 MIT students captured this photo by launching a balloon and camera into near-space. Total cost: $148. But that never stops him. His latest concept -- to launch a camera into near-space using a weather balloon, a cell phone, hand warmers and a drink cooler -- fell flat when he sent out an e-mail message to dozens of his classmates, asking for help. Unfazed, Yeh managed to find one friend willing to chip in. And on September 2, the go-it-alone pair floated a balloon-camera high enough into the atmosphere to photograph the curvature of the Earth and the deep black of space, all on a lunch-money budget of $148. "I didn't have a lot of people who wanted to do it with me, so I'm really glad I stuck it out and succeeded in what I wanted to do." Since then, the duo has received a number of requests from other would-be space photographers, asking for their project notes. Yeh said he will post those soon on the project's Web site at 1337arts.com. They've gotten so many inquiries they had to post this warning: "CAUTION/DISCLAIMER: Launching things into the stratosphere can be DANGEROUS! Please contact the FAA before trying ..."
iReport.com: Will you watch the shuttle launch? These enterprising students seem to have hit a nerve with the public, probably because their effort costs so little, suggesting that anyone with some know-how and a few common tools can photograph the edge of space. That's something normally reserved for big-budget agencies like NASA. They're also tapping into the exploding do-it-yourself movement online. Web sites like Makezine.com and Instructables offer blueprints for people who want to make everything from wiener-dog wheelchairs to self-playing harmonicas. Most of the inventors who use these sites care more about the ideas and the sense of community and accomplishment than traditional rewards like copyrights and cash, said Eric Wilhelm, a former MIT student who is now CEO of Instructables. Yeh and Lee are far from the first people, or even the first students, to send balloons into near-space to take pictures. But their on-the-cheap methods and stunning images have earned them a glowing reputation among those who paved their way. Yeh and Lee also learned from those who came before them. They did tons of Internet research during the spring semester and over summer break, so that when they arrived back on MIT's campus in Cambridge, Massachusetts, they set right to work. All of the parts they used are commonly available. Yeh and Lee bought a Canon camera on eBay and then fastened it inside a Styrofoam cooler. A hole poked in the side of the container let the camera lens gaze out into space, and they attached a Motorola Boost cell phone to the camera so it would send GPS coordinates back to Earth. The antenna from a wireless router was hooked up to the mobile phone to give it the extra antenna power needed to send the coordinates down. And the students taped a hand warmer -- the kind skiers put in their gloves -- to the mobile phone's battery so it wouldn't freeze. The plan seemed simple enough -- at least to the MIT students. They would fill a spherical weather balloon, available online, with helium and float the entire cooler-camera-cell-phone apparatus high into the atmosphere. When the balloon had traveled about 17 miles up, air pressure would cause it to pop, and a parachute dangling from the side of the cooler would lower the contraption back to Earth. Then the GPS in the phone would tell them where to find their camera, which they set, using open-source software, to take photos every 5 seconds. Yeh and Lee knew that wind would change their contraption's course after launch, so they went on a free Web site to try to calculate roughly where the balloon would go. After some consideration, they decided to launch the balloon from a field near a warehouse in Sturbridge, Massachusetts. That was far enough from the coast, they hoped, to avoid sending the balloon and the camera into metro Boston or the Atlantic Ocean. But, not quite sure of the calculations, they pasted this note on the side of the cooler just in case: "If found, please call [their phone number]. ... Material contents are 100% safe/non-toxic/non-flammable and are part of a student science project. $40 reward." They rented a Zipcar, loaded up the cooler and left their apartments that night. After adding one person to the team -- a new student Lee had met at MIT orientation -- they drove 60 miles inland and slept on the ground at a parking lot, the car and their big idea waiting beside them. In the morning, they launched. What if the phone battery died? What if it froze? What if the device crashed down to Earth too hard and the camera broke? What if it landed in the ocean? Or hit a person? Or a plane? The chance for a mishap seemed tremendous. Four hours after the launch, Lee said, the team thought all was lost. "We were like placing bets on whether we thought it would work or not," the 23-year-old mechanical engineering grad student said. "Early on, we were optimistic that it would work. About 4 hours after, [when] we hadn't heard any news about the device, we had sort of given up hope. We'd thought we'd lost it." Dejected, the group drove back to Boston to Lee's apartment. They checked his computer and found an unlikely signal: The camera had landed in a construction zone outside Worcester, Massachusetts, about 25 miles from the launch site. "We were so excited, we jumped right back into the car, and we drove out to Worcester, and we found it. That was a great moment," Lee said. They were amazed with the results. The camera was unharmed. The hand warmers were still hot. And the photos were amazing. "There's something that's fascinating about seeing the Earth from high -- I can't quite put my finger on it," Lee said. "But there's something just beautiful about seeing that." He said Yeh is the kind of person who has tons of zany ideas, so many that he's not always taken seriously. "Oliver also has a tendency to dream big without necessarily thinking about the required steps," he said. "He was like, 'Oh, let's go into space tomorrow!' And I was like, 'No, Oliver, we can't just release a balloon into space tomorrow ... We want it to succeed. We don't want it to fail.' "
Lee said he admires Yeh's out-there imagination -- and his ability to follow up on his dreams. "A lot of people have ideas but don't do anything with them, but he actually does them," Lee said. Yeh's favorite photo is one captured at 93,000 feet, just as the balloon rises to its highest point and pops, revealing the black or space behind it. It's as if he had to let his vision reach its most insanely illogical peak before it produced something truly remarkable.